Most of my “reading” these days consists of listening to books-on-CD on long car journeys. In many ways, it’s a great way to read, because there are few interruptions, and long miles to ponder the authors point. 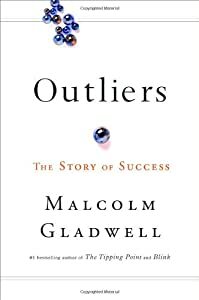 I “read” Malcolm Gladwell‘s 2008 book Outliers: The Story of Success recently. Gladwell has become a controversial star in the social science world. On the one hand, his bestsellers The Tipping Point and Blink (and now Outliers) have generated a lot of controversy. Gladwell draws on – and popularizes – a great deal of research in social science. Given the difficulty social scientists have in drawing public interest to their work, some – like Brayden King at OrgTheory.net – consider the inaccuracies in Gladwell’s work to be a small price to pay for the good publicity. Others consider him a detriment to the field because he amplifies one side of a research question and ignores the findings that question or undermine that point of view. I was aware of this background when I picked up Outliers at the public library. The book was, as expected, enjoyable. No one disputes Gladwell’s skills as an author. He has the ability to ask a research-based question and then find the stories to which it most directly applies. In Outliers, he explores the background story to the success of the Beatles, Bill Gates, and players in the National Hockey League – and to the terrible record of accidents of Korean Air Line. The stories are gripping, and the explanations interesting. Any careful reader will, of course, need to follow-up on his many references if they want a more nuanced and detailed analysis. This is, I think, my favorite of Gladwell’s books to date. He doesn’t just explore the roots of unusual levels of success: he explodes the myth of genius or exceptional talent that forms the core of most biographies. Where a psychologist would explore the factors in Bill Gates’ personality that led to his success, Gladwell takes a sociological approach. He explores the material (a computer in his 8th grade classroom) and social resources (parents who advocate for free computer time for their children) that gave Bill Gates an huge advantage – thousands of hours of programming time – over others when he began to tackle the problems that brought him success. His consideration of hockey players – and the way birth month interacts gives older kids a very slight advantage in grade school – provides a different example of the way something socially determined plays out in greater access to to elements that lead to success. It’s not that the best hockey players – or Bill Gates – don’t have exceptional skill. Rather, Gladwell points to the impact of their surroundings in helping them foster an interest and skill. Without those social factors, their skill might have been lost. If you enjoy good stories and like a bit of social science research on the side, Gladwell’s Outliers is enjoyable and thought provoking: recommended.